The HookumGood Bait Buoy gives you all the important necessities at hand. 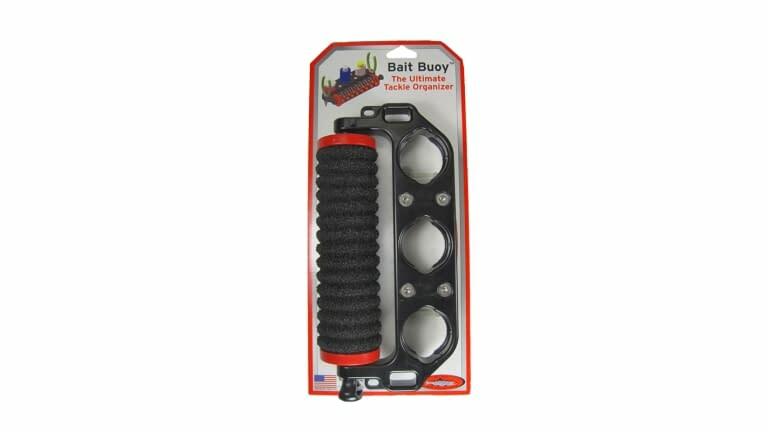 Have your leaders, scents-bait, pliers, cutters, towel and fish club close at hand. Rigid, marine grade, UV resistant, weather-proof construction makes this unit darn near bullet proof. Three slots will hold egg jars or scent bottles round and oval. Slots on the ends will accommodate pliers or cutters. One slot to fasten either a towel or a fish club. Interchangeable leader rolls holds leaders safely and securely. Unit mounts quickly and easily to any 7/8" thru 1 1/16th boat rail or side wall.